SEJ posts information about the work of young journalists who are making an impact on their world; opportunities; useful websites; and items of interest about news, activities and events centered on young people implementing change. The Society for Neuroscience Science Journalism Student Award enables students pursuing a science or medical journalism degree to attend the SfN annual meeting. Two students get complimentary meeting registration, four nights’ lodging, a mentor, access to SfN staff and $750 to help defray the expenses of attending the meeting. Deadline: May 13, 2019. The Institute for Environmental Journalism Summer 2019, run by the Pulitzer Prize-winning news organization InsideClimate News, comprises two summer journalism programs (coastal Maine or NYC) for high school students and recent graduates as an introduction to the process of environmental journalism. Financial aid available: Apr 15 deadline. Application deadline: May 15, 2019. Based at Boston University, the New England Center for Investigative Reporting’s Summer Journalism Institute is a perfect opportunity for U.S. and international high school students to learn more about journalism, including new and valuable skills. Choose from three two-week sessions. Application: Rolling basis beginning Oct 2018; final deadline is June 1, 2019. Financial assistance: scholarships available (deadline Jan 31, 2019); financial aid (deadline Apr 1, 2019). 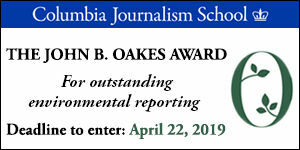 The Evert Clark/Seth Payne Award recognizes outstanding reporting and writing in non-technical, print journalism only, in any field of science, by science writers aged 30 years and younger. The winner receives $1,000 and expenses to attend the combined annual meeting of the National Association of Science Writers (NASW)/Council for the Advancement of Science Writing (CASW). Deadline: Jun 30, 2019. The Robert Bosch Foundation Fellowship Program, which begins in September annually, is for US professionals 40 years or younger (with 5+ years relevant work experience in their proposed field of work in Germany). Fellows complete a 9- to 12-month professional development program consisting of one or two high-level work phases in major German institutions and a traveling, European-wide seminar series. Typically, at least five of the competitively chosen fellows are from the field of Journalism/Mass Communications. The Bosch Foundation places fellows at major German news publications and broadcast media outlets. Includes stipend. No German language skills are required at time of application; intensive pre-fellowship language training is provided. Deadline: Nov 1, 2019. Financial Aid for Minority Students and Others lists resource guides for ethnic groups, women, LGBT and any underrepresented demographic. Pulitzer Center on Crisis Reporting Grants cover hard costs associated with upcoming travel for an international reporting project. The ideal project offers print, photography, radio, and video. Opportunities include travel grants to students at participating Campus Consortium schools. Rolling deadline. The American Society of News Editors' Youth Journalism Initiative helps students learn why news matters and acquire the skills needed to succeed as 21st-century citizens. The Initiative invests in the future of journalism and democracy by providing resources and training in youth journalism; news, information and media literacy; and the First Amendment and civic education.. The 2019 Lorenzo Natali Media Prize will be awarded in three categories, one of which is the Best Emerging Journalist Prize: open to journalists under 30 whose media is headquartered in any country where DG DEVCO and DG NEAR provide development assistance, as well as in the EU Member States. Prize is €10,000 and a work experience with a media partner. Deadline: Apr 14, 2019. To encourage students to sharpen their abilities to communicate the outdoor experience, the Outdoor Writers Association of America offers the annual Norm Strung Youth Writing Awards. The contest features separate categories for poetry and prose, with cash awards in each, for two different divisions, senior (grades 9-12) and junior (grades 6-8). The work must have been published in a newsletter, newspaper, magazine, literary collection, etc. during the previous calendar year. The publication can be school or club related, or commercial. Deadline: Apr 12, 2019. SEJ's annual Awards for Reporting on the Environment has a new student category, the Ray Reece "Future of Environmental Journalism" Student Award. First-place winner receives $500, trophy and a certificate (and is automatically entered into the Pulliam award judging for $10,000). 2nd place: $250 and a certificate. 3rd place and honorable mentions will receive a certificate. 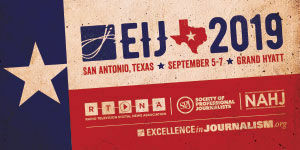 In addition, the first-, second- and third-place winner(s) (or selected representative, if a group project) will receive travel and registration expenses to receive the award at a luncheon during SEJ's 29th Annual Conference in Fort Collins, October 9-13, 2019, and to attend the five-day conference. Deadline: April 1, 2019, 11:59 your local time. Young people develop their written, speaking, communication and leadership skills, while learning about diversity, through the annual Asian American Journalists Association's JCamp. The program is not limited to Asian American students; it's open to all high school students. Deadline: Mar 31 for the Jul 27-Aug 1, 2019 program at Georgia Public Broadcasting in Atlanta, GA.
Canada's National Eco-journalism Competition for Youth is an annual competition, part of Young Reporters for the Environment's international awards program. The Canadian program is coordinated by Environmental Defence, and recognizes inspired stories, photos and videos about local environmental issues from 11-18 year olds. Winners have the chance to be published on Alternatives Journal's website and/or featured on the YRE website and newsletters. Deadline: Mar 29, 2019. Bodie McDowell Scholarships are usually given annually to three or more students of outdoor communications fields including print, photography, film, art or broadcasting. The awards, offered by the Outdoor Writers Association of America, can range from $1,000 to $5,000. Open to all college students, undergraduates in their Junior or Senior year of study and graduate level, from all communications and journalism disciplines and all schools. Deadline: Mar 1, 2019. Media professionals, age 40 and under, from the U.S., Canada and Germany are invited to apply for the Arthur F. Burns Fellowship, an opportunity to report from and travel in each other's countries. Share professional expertise with your colleagues across the Atlantic while working as a "foreign correspondent" for your hometown news organization. Deadline: Mar 1, 2019 for U.S. and Canadian applicants. The Native American Journalists Association's annual Native American Journalism Fellowship is open to current American Indian, Alaskan Native, Native Hawaiian and First Nations college students, undergraduate and graduate, pursuing media degrees. Improve your reporting and multimedia skills, while learning from tribal journalists and news industry professionals from across the country during an on-site immersion newsroom experience in Prior Lake, Minnesota, Sept. 12-19, 2019 in coordination with the 2019 National Native Media Conference. Deadline: Feb 28, 2019. In the U.S., youth between the ages of 11 and 19 may enter the Young Reporters for the Environment USA competition in one of three age categories, as individuals or as part of a class or group. Participants investigate an environmental issue and report on it in writing, photography or video. Entries must be relevant to participants’ local community, connect to a global perspective, include possible solutions, and be disseminated to an appropriate target audience. Winners will be selected in each age bracket for each media type. First-place winners in each category will continue to the international competition. Deadline: Feb 22, 2019. The NAJA/NBC News Summer Fellowship, a partnership between the Native American Journalists Association and Comcast NBCUniversal, gives NAJA member-students real world experience and exposure to one of the world's leading news divisions as a paid summer 2019 intern. Deadline: Feb 22, 2019. Student writers (or aspiring student writers) are invited to enter the David Carr Prize for SXSW 2019, March 8-17 in Austin, TX. Enter an essay or short story of 1,500 words or less completing the question “In 2050, warmer global temperatures will lead to…” Deadline: Feb 15, 2019. The Livingston Awards for Young Journalists, for excellence by professionals under the age of 35, judge print, broadcast and online entries against one another, a practice of increasing interest as technology blurs traditional distinctions between rival branches of the profession. Three $10,000 prizes. Deadline: Feb 1, 2019. The Radio Television Digital News Foundation offers scholarships for outstanding students and fellowships for young professionals (<10 years experience in the field) pursuing careers in radio, television or online news. Both the Michelle Clark Fellowship and N.S. Bienstock Fellowship are given to promising minority applicants. Deadline: Jan 18, 2019 extended to Jan 31. The Grist Fellowship Program in Seattle is an opportunity for early-career writers, editors, and others with diverse backgrounds to hone their journalistic skills at a national news outlet and deepen their knowledge of environmental issues. Fellows will make daily contributions to Grist’s editorial operations. The six-month fellowship, which runs twice yearly, pays $2,750 per month. Next deadline: Jan 14, 2019. The annual Cinema Verde International Environmental Film and Arts Festival in Gainesville, FL, features documentaries, shorts and student films with art, music and an ecofair. The event seeks to broaden the reach of sustainability education and to help make the world a place where we want to live. Multiple categories, including three for students. Deadlines (for Feb 14-17, 2019 festival): Jul 27 (early); Sep 27 (regular); and Oct 17 (final). The SEJ Emerging Environmental Journalist Award, launched in Oct 2015, recognizes students with outstanding potential in environmental journalism. And the program offers members the chance to directly advance SEJ’s mission with university and college officials. 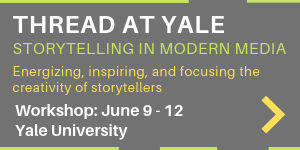 Deadline: May 1 annually. Amnesty International Canada's Youth Media Awards honour students who have created content covering international or national human rights issues with a particular emphasis on how they impact young people. Deadline: Mar 1, 2018. The Alexia Grants are awarded to students and professional photographers to give them the financial ability to produce substantial stories that drive change in the effort to make the world a better place. Students also get scholarship opportunities. Deadlines: Professional grants — Feb 1, 2018; student grants — Mar 1, 2018. Next deadlines will be announced in summer 2019. The Korva Coleman Excellence Awards recognize outstanding digital media pieces produced by youth. Ages 14-23 are eligible to compete in the categories of audio, video and online print. Winner of each category receives a $1,000 scholarship and a trip to accept his or her Crystal Korva Award in person at the Spring 2018 awards dinner in Phoenix. Deadline: Jan 31, 2018. The Climate Cost Project's Witnessing Change Video Competition asks high school and college students to make videos that tell stories about the climate impacts experienced by their own communities. Cash prizes of $500 and $250 for first and second place for each competition, and the project will promote winning video as a critical educational tool on the personal and financial costs of climate change that are happening in America now. Deadline: May 1, 2017. Kids These Days... Looking Out for Their Own Future, a panel during SEJ's 21st Annual Conference in Miami, October 2011, featured young environmental activists who discussed the initiatives they started at their schools and in their communities. Scientific American features SEJ member Rebecca Burton on its SA Incubator blog, June 11, 2013. Visit Rebecca's personal blog on health, science and hula-hooping: Layman’s Terms Media. "Lakewood Ranch Student Wins $50,000 Google Prize"
"Out-of-Door Academy rising senior Brittany Wenger was chosen from among 5,000 students from more than 100 countries who entered the annual competition. At an event to honor the 14 finalists held Monday in Palo Alto, Calif., judges chose Brittany's artificial intelligence computer program that could provide a cheaper and less invasive method to detect malignant breast tumors as the winner." By Christopher O'Donnell, Sarasota Herald-Tribune, July 24, 2012.